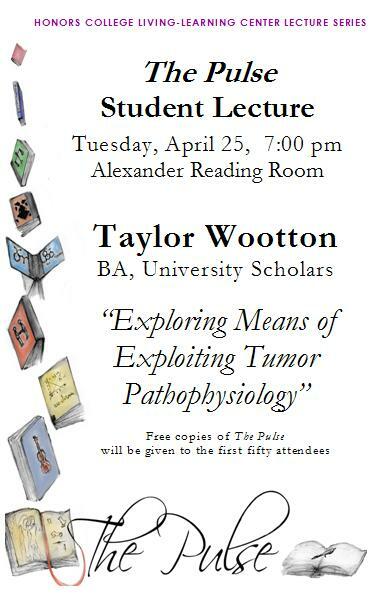 The Pulse Student Lecture held on April 25, 2006 featured Taylor Wootton (BA University Scholars, 2006), winner of the 2006 Wallace Daniel Award for Undergraduate Writing, presenting her paper, “Exploring Means of Exploiting Tumor Pathophysiology.” This paper describes the pathophysiology of tumors, reviews past methods of exploiting such pathophysiology against the disease, and outlines the author’s original research project of synthesizing combretastatin analogues with conformational flexibility which can be coupled to bioreductive drugs. The event also included recognition of all published authors of The Pulse 2005-2006 year, as well as their faculty mentors. Check out the photo gallery for our 2006 Lecture Series. featuring: "Think Globally, Eat Locally", "The Education of Harry le Roy", Rawls's Theory of Public Reason in First Amendment Cases of the Rehnquist Court", "On Free Will: Edwards in Conversation with Arminians", "Exploring Means of Exploiting Tumor Pathophysiology"